With over 50 years of business consulting experience the Balanced Growth team has had the privilege of working on hundreds of projects across multiple industries and many diverse organizations. From this experience, we have developed a proven methodology that we use consistently with all our engagements. We call this the BG360 Method. It is this approach that we believe differentiates our value proposition and our services from most consulting firms. The BG360 Method has a singular and all-important focus – creating sustainable value for your organization. At Balanced Growth we approach every project with the aim of delivering the results you expect. 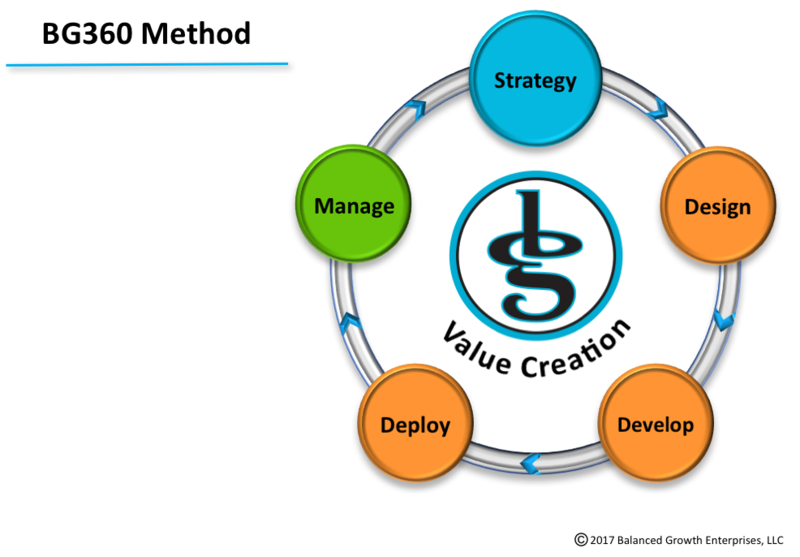 Whether it is customer value creation, revenue generation, cost savings, productivity, quality, or performance improvements, or risk management, the BG360 Method helps us achieve this aim. We start each project with a mission statement focused upon your most important business objectives. Our analytical approach and problem-solving ideas are based on producing the results you expect. After gaining clarity about your needs and strategic priorities we develop business solutions that will have a forward-looking and sustainable impact on your organization. One of the hallmarks of our approach is the ability to develop strategies that cross multiple functional areas. We work seamlessly and efficiently across organizational boundaries to integrate the necessary improvements and solutions that create value for our clients. Innovation occurs when ideas are put into action. All of our projects deliver practical solutions aimed at building momentum that accelerate the attainment of the desired results. The Balanced Growth team is laser-focused on designing solutions collaboratively with your functional leaders. Through this co-creative solutioning strategy we develop the best solutions with the highest probability of internal acceptance and success. The BG360 Method is rigorous, but not rigid. Our approach is always tailored to your organization’s unique needs and culture. Each project is unique in terms of scope, complexity, and urgency. The BG360 Method follows three phases: the strategy phase, the implementation phase, and the post-implementation phase. We ensure that each phase is fully aligned with the strategic priorities determined at the outset of each engagement. Download our Statement of Qualifications to learn more about Balanced Growth.